12/12 2:42 pm Romeo brings yet another fish, and Juliet feeds the hungry bobbles again. Romeo & Juliet have a little tug of war over a fish..what an impressive full pantry! 3.12 pm Romeo and Juliet enjoyed a nice meal and then NE18 was fed "once again". Juliet allows Romeo to keep his little ones warm while she takes a break. 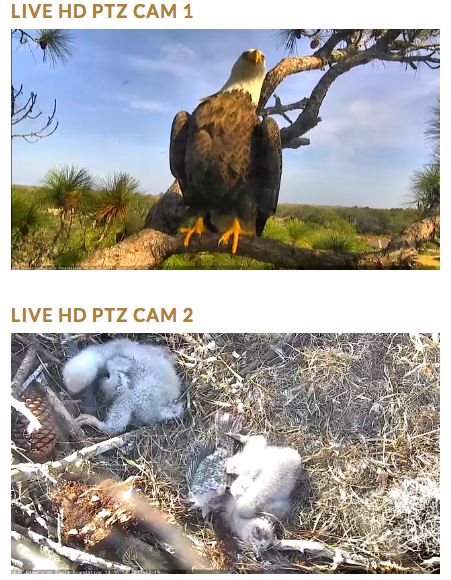 12/15 9.23 am Mom feeding NE 18 and NE 19 . I also saw some bonking earlier. Don't forget to add the copyright info to your posts that include pictures from AEF. I think I posted the info while you were away, Loza. I added it to the posts you have made and I will try to watch for it in the future. AEF Picture guidelines "AEF invites anyone to post photo and video screenshots/screen-recordings captured from these high definition cams. Since these photos and videos can be copied and duplicated over and over, we request that when you post these up to Facebook, IG, Websites, Blogs, or another social media location, the following information be included at the end of your photo/video caption: © 2017 American Eagle Foundation, EAGLES.ORG. 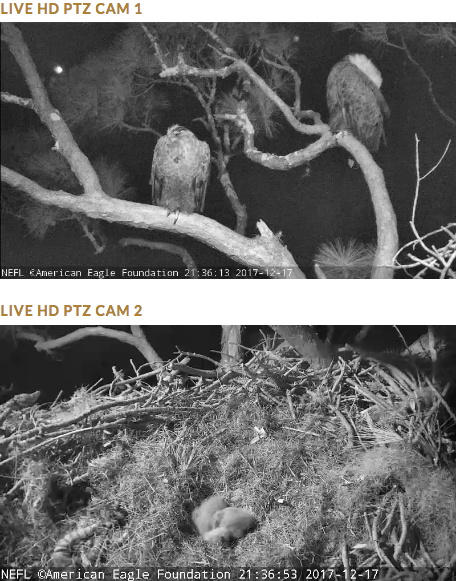 These live feeds are the intellectual property of the AEF, and we kindly request that you do not attempt to embed or live stream these feeds on your website, blog, app, etc., or attempt to monetize screen shots or video captures. Thank you for your cooperation!" Loza does show copyright embedded @ the bottom of each photo itself. Only thing missing is EAGLES.ORG. It's more prominent in some than others, but there. Thank you, SWINWK! My eyes are not good enough to read that, however, I went full screen and could just make out the © symbol at the bottom of each cam view. That certainly makes it a lot easier. So I guess we only need to worry about it if we cut off the bottom. 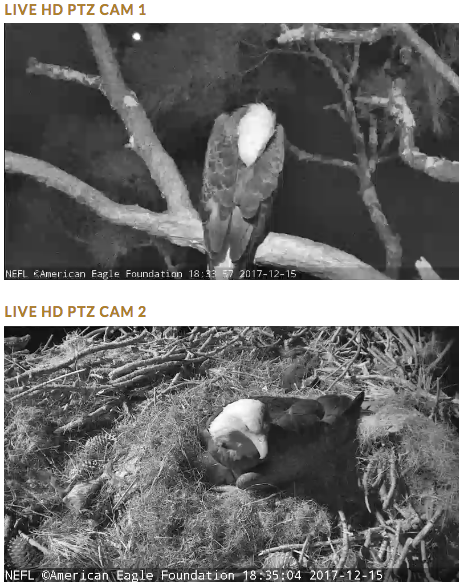 Right now: Romeo snoozing after a day of providing for his family while Juliet rests atop her eaglets. And I got the © in my images!! :santadance: 2 weeks old and looking good. Hot day in Florida today. Romeo was babysitting on a nearby branch, but the kids were getting warm in the sun. 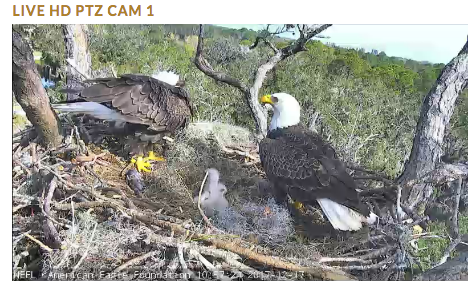 N18 was looking to escape the nest bowl for a cooler spot. 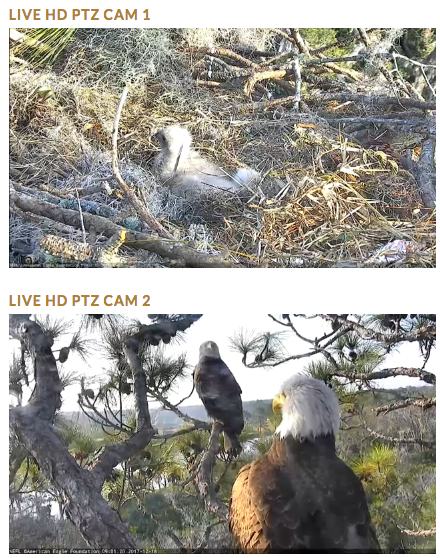 Dad noticed the situation and dropped down into the nest to become a "dumbrella" and provide some needed shade. With that, the kids settled down for a nap. 11:38 am - The kiddies in the hot sun. 11:43 am - Dad to the rescue, providing some much needed shade. Good job Romeo! 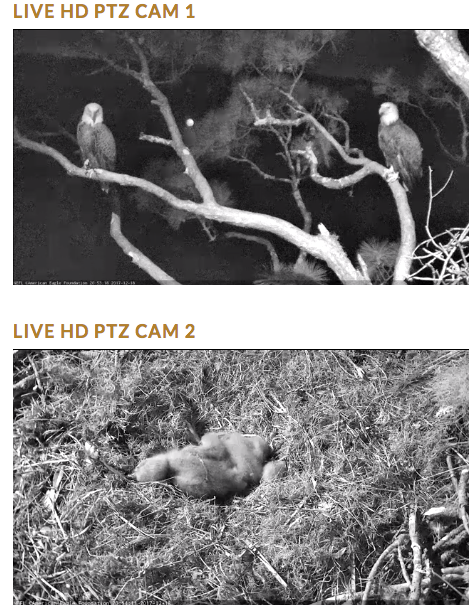 Some bonking but not the kind we expect with little eaglets. 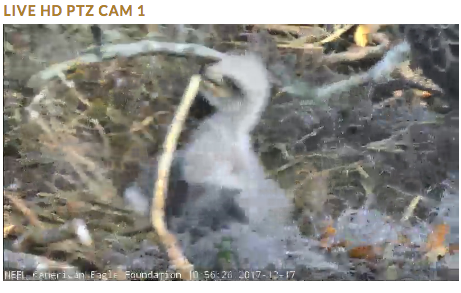 Romeo brought in a sizable stick (you can see it behind the eaglet) and promptly dropped it right on Baby. 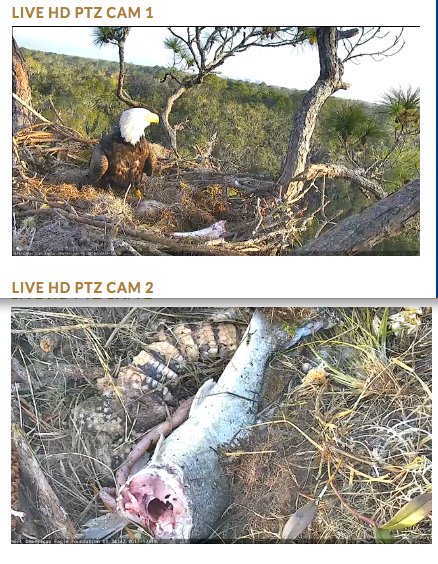 Cams zoomed in and Baby seemed to be okay. Juliet immediately removed the new furnishing and then the camera zoomed out to capture this family picture. A quiet night at the aerie. A few wiggles and talon stretching, but slumber for the most part. All's quiet on the Northeastern front. Haha Gigi. I saw that earlier and thought the same thing. I wonder what kind of fish! I'm really enjoying this site. Mod reported Romeo was knocked off his branch again tonight!! 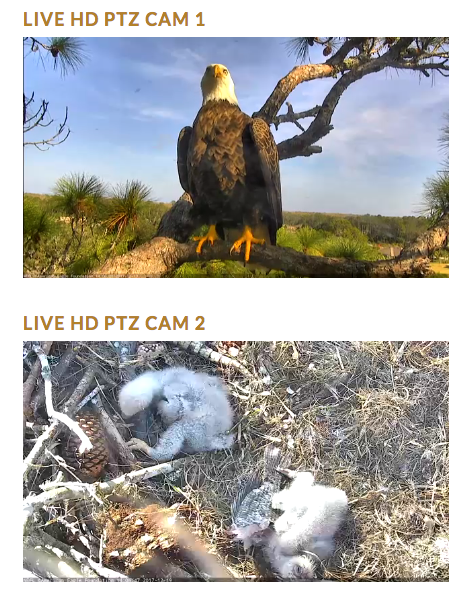 Juliet was on a branch nearby and she immediately flew to their babies who snoozed through out the event! I am assuming it was the barred owl again. Romeo unscathed, came back right away! YIKES SWINWK! I did not see that. I forgot to post these from earlier today. Juliet seemed tuned into something. Thank you ALL for such great updates, pics and videos! 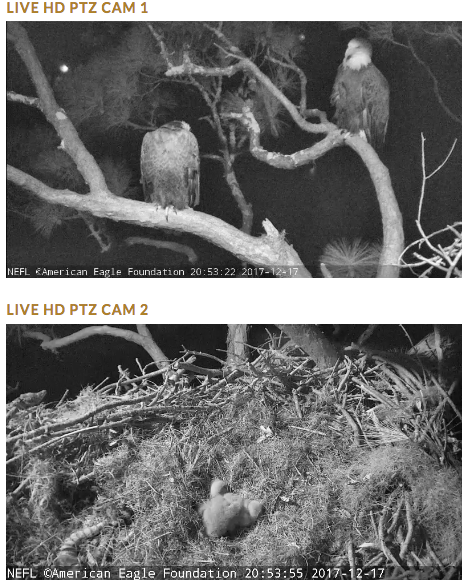 This nest is always such a pleasure to watch (even though those night visits are scary! ).